Ahmed* sits patiently in the crowded waiting room of the primary healthcare centre in Hawija, Iraq, where MSF provides medical consultations and treatment for people living with chronic conditions such as diabetes, asthma and cardiovascular disease. He is absorbed in his thoughts as the pale neon light buzzes above him and the power repeatedly cuts out. Ahmed is 35; the wrinkles on his face suggest a life burdened by hardship and worry. Zainab, his 16-year-old sister, sits close beside him, tapping her knee nervously with her fingers. An undisciplined lock of dark hair has escaped the blue headscarf framing her face. Both Ahmed and Zainab look anxious as they wait to hear the doctor’s opinion on their mother, who suffers from hypertension. The family live in a village in Al Riyadh area, not far from Hawija – a district that was under the control of Islamic State (IS) group for almost four years and underwent a long siege. A military offensive drove IS group out of Hawija district in October 2017, leaving swathes of destruction behind. With the military offensive over, many of those who fled the region are slowly beginning to return with the aim of rebuilding their lives. Nonetheless, episodes of violence still occur in this rural region, and insecurity persists along the highway, which is scattered with military checkpoints. The recent conflict has left its mark on Hawija district, and health facilities have not been spared. According to the Iraqi Ministry of Health, 35 percent of primary healthcare centres in Kirkuk governorate no longer function, leaving many people’s medical needs unmet. 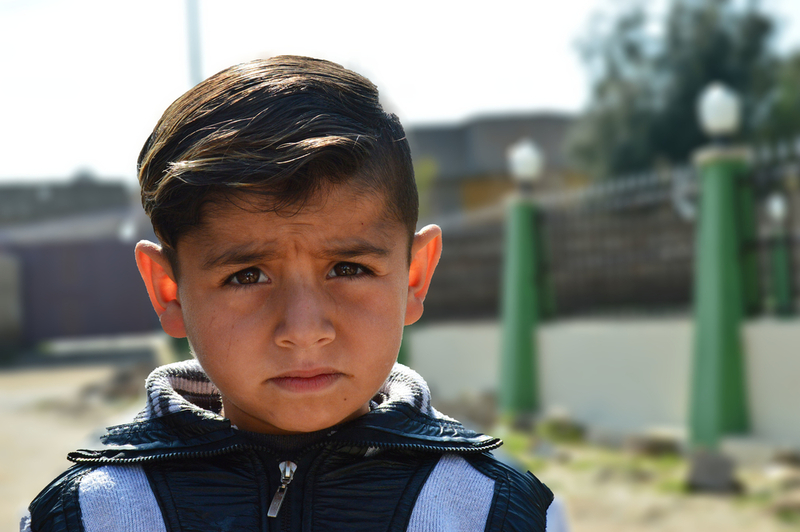 Mahmoud, aged five, comes from Al Shajara village, some 18 km from Hawija. Diagnosed with diabetes when he was two, for the past few years Mahmoud has been unable regularly to take the treatment he needs, due to the lack of functional health facilities and the district’s insecurity. During the military offensive, a rocket exploded just beside his family’s house. The noise was ear-splitting and Mahmoud was terrified. For many months after the explosion, Mahmoud has been waking up at night, crying and screaming from nightmares. Now he visits MSF’s clinic in Abassi once a month for a medical consultation and treatment. In response to the lack of medical services in Hawija region following the recent conflict, MSF began to work in the area in December 2017. Initially MSF teams worked in Abassi sub-district, providing treatment for non-communicable diseases, as well as clean drinking water, to residents returning to the area, in collaboration with the Iraqi Directorate of Health and Water. In April 2018, MSF began supporting Hawija primary healthcare centre and Hawija public hospital. In Abassi and Hawija, MSF teams are providing medical consultation and treatment for non-communicable diseases, mental health support, health education sessions and advice on health living, such as maintaining a healthy wait and being physically active. In 2018, more than 1,580 patients living with chronic diseases received consultations and treatment in Hawija primary healthcare centre, and more than 1,820 people attended health education sessions on chronic diseases, sexual and reproductive health, psychological first aid and endemic diseases. In the same period, more than 1,330 patients living with chronic diseases received consultations and treatment at Abassi primary healthcare centre, more than 6,000 people attended health education sessions and 253 patients received psychological support. MSF responded for the first time in Iraq in 1974, providing medical aid to the displaced population along the Iraq-Iran border. MSF has been working continuously in Iraq since 1991, and today provides primary and secondary healthcare, services for expectant and new mothers, treatment for chronic diseases, surgery and rehabilitation for trauma patients, mental health support and health education activities, in the governorates of Baghdad, Diyala, Erbil, Ninewa, and Kirkuk. MSF started working in Kirkuk in 2009. In 2017, MSF responded to the urgent medical and humanitarian needs of people displaced in the region by the recent conflict, running mobile clinics at the entry-points of Dibis and Maktab Khalid, providing medical treatment for people in Daquq camp, including treatment for non-communicable diseases, mental health services and health education sessions, and supporting the emergency departments of Azadi and Kirkuk general hospitals. *Names of the patients have been changed to protect their identity. **The current average price of a paracetamol box in Iraq is 500 IQD (around US$0.40).